This is a very personal description of the sailing trips with the S/Y Thetis, based on the boat’s logs. I have been traveling in Greek and Turkish waters with Thetis since 1984 but I did not keep a very detailed logs until 1996 when I ventured further to Malta and Sardinia. The logs are illustrated with photographs and includes some historical and geographical descriptions of the places visited, as well as several links to related web sites. The the cruises with S/Y Thetis, range from the Black Sea on the east to the Caribbean on the west. 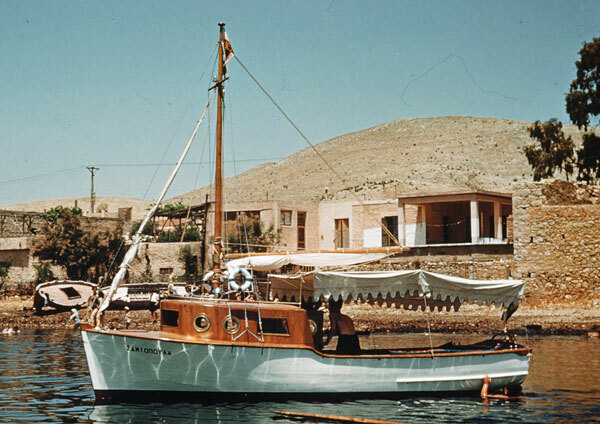 For many years I was dreaming of long sailing trips, ever since my father got his first boat in 1950, the venerable Samiopoula, a boat constructed like a Greek caïque but in the shape of a motor cruiser and with sails. This was my first introduction to sailing. My father loved to go fishing and always took me as his crew. From him and his fishing friends I learned the ways of the sea and to respect her. My love of the sea during my youth had no bounds. I sought out fishermen who were still using sails, and I spent many hours listening to their fantastic stories. Later, as a teenager, since I was unable to afford fuel for the small outboard boat I had, I converted her to a square rigged sailboat, using her tent as a sail and the tent poles as masts. This is how I learned to sail. All through this time I always dreamed of long distance voyaging to exotic and far away places. The thought of crossing an ocean first materialized when I met Savvas Georgiou who, with his wife, crossed the Atlantic, in a small engineless sailboat, and reached Greece. 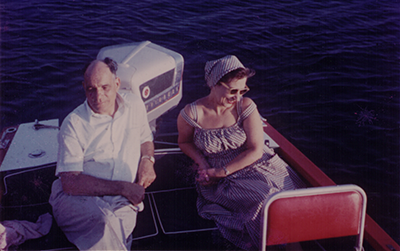 In the late 1950s my father sold Samiopoula and got a 16' speed boat made by Chris-Craft. He named her Delfini. This boat was originally equipped with two 18 hp outboard engines and later by a single 50 hp, the largest outboard then made by Evinrude. As a teenager I was, of course, thrilled by the speed and loved water skiing, a novelty in Greece at the time. But I soon realized that in order to fulfill my long distance voyaging dreams I would need a sailboat. All such thoughts were put to rest during my student years and while raising a family. But in 1984 I did manage to buy my very own sail boat, Thetis. Since then, and for many years, I have been sailing together with my family for at least two weeks every year. We have been to many wonderful places in the Aegean islands, the Turkish coast, the Ionian islands, and around the Peloponnesos. But as I had limited vacation time, long distance trips were totally out of the question. In 1995 my situation changed drastically. I was offered early retirement from COMSAT Laboratories where I had worked for 22 years. This was an opportunity to realize my long-held dream, so I eagerly took it, being aware that I might be sacrificing a steady income and limiting my practice in a profession which I did enjoy very much. At that time I contemplated selling Thetis and buying a larger, more suitable boat for long trips. However, after some market research I realized that any used boat that I could afford was not much better than Thetis so I decided to upgrade Thetis for ocean crossings. During the winter of 1996 I started studying routes and reading about ocean crossings. Originally I had planned to cross the Atlantic Ocean in the late 1996. But then I decided on a more conservative approach and I changed my plans to first make an extended test trip within the Mediterranean and, based on this experience, to plan ocean crossings for the following years. I started preparations for this test trip by outfitting Thetis with several new items in order to increase her safety and comfort. These included a radar, a new GPS/Chart Plotter receiver, a radar reflector, new night time binoculars, a wind generator, a redundant VHF antenna, an EPIRB emergency transmitter, an improved passarella (gangplank), etc. In 1995 I had a major overhaul of the motor. During the spring of 1996 I had the keel, rudder, and all the rigging inspected. Any questionable item was replaced. In addition, I had an anti-osmosis treatment applied to the hull, repaired all the windows, and tested the cabin for leaks. During the summer of 1996 all these changes and additions were tested. So everything was ready for the Malta-Sardinia trip in the autumn of 1996. Following the experiences of the 1996 trip, a few more additional items were installed. These included replacement of all the Plexiglass of the cabin windows, a heavy duty fuel filter/water separator between the fuel tank and the engine fuel filter, a Navtex weather receiver, an Autolink automatic telephone dialer/pager, and an AC battery charger. Also, many of the electrical cables were upgraded and some new tools and spare parts were added to the boat’s inventory. In 1997, my wife, Alice, was on a Sabbatical from Howard University where she was a professor in the department of Classics. Since I wanted to spend more time with her, I decided to take an extensive trip in Southern Turkey (which affords considerable archaeological interest) and to postpone the Atlantic crossing for late 1998. In the summer of 1998 my plans for long range sailing, as I explain in the 1998 log, had to be suspended due to health problems. Nevertheless, I did manage to sail with my brother's boat Faneromeni from Lesvos to Istanbul and later with Thetis from Athens to Samos, the Cyclades, and Dodecanese, and in the late summer to the Northern Aegean and the West Sporades. The summer of 1999 was dominated with the trip to the Black Sea. Thetis sailed in early June from Athens to Samos via the Cyclades. In the middle of July we sailed north along the Turkish coast via the Dardanelles to Istanbul, from there we entered the Black Sea and we sailed fast as far Samsun. The return trip was more leisurely. On the way, we saw the total solar eclipse. After many adventures we returned to Istanbul and started on our way back to Greek waters. We were only 70 M away from Istanbul when the devastating earthquake of August 17 hit the country. After exiting the Dardanelles, we visited the Turkish island of Imvros, and re-entered Greece in Limnos. From Limnos we sailed back to Samos and, after a rest there, back to Athens. In 2000 there was no trip outside of Greece. I sailed Thetis east from Athens to Samos. From Samos there was a trip to Astypalea and back, and, after a few weeks rest, a cruise that made a circle of the Aegean: Samos, Santorini, Skiathos, Trikeri, Chios, Samos, and Leros. In the Spring of 2001 the Turkish edition of the Yachting World Magazine inaugurated a monthly column written by yours truly and based on these web pages. The articles were, like the web, written in English and then translated into Turkish. Alas the magazine fell victim to the economic crisis in Turkey and ceased publication in June of 2001 so my journalistic career was rather short lived. Nevertheless they did write, in Turkish, what seems to be a nice introduction to the column. The sailing of 2001 was dominated by a trip to Malta, Tunisia, and the Italian islands of Pantelleria and Lampedusa. On the return we cruised in the South Peloponnesos and in several Aegean islands. A second trip led us to Chios, Psara, the Northern Sporades, Evia, Hydra, Poros, the Cyclades, Fourni, Samos, and Leros. 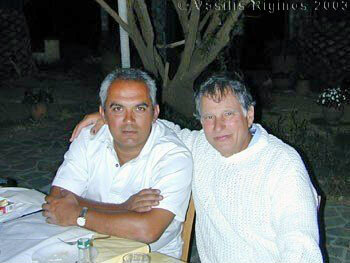 In 2002 there were two sailing trips. The first, in the late spring and early summer, was to the NE Aegean, from Leros to Alexandroupolis (Lipsi, Marathi, Samos, Chios, Lesvos) and back to Samos with several days layover in Çesme in Turkey. The second trip, in the late summer and fall, was to the SE Aegean, it started again in Leros. From Leros we went to Niseros, Symi, Kos, Kalymnos, in the Dodecanese, to the Hisarönü Körfezi in S. Turkey, and to Naxos, Schinousa, Iraklia, Amorgos, and Levitha, in the Cyclades. 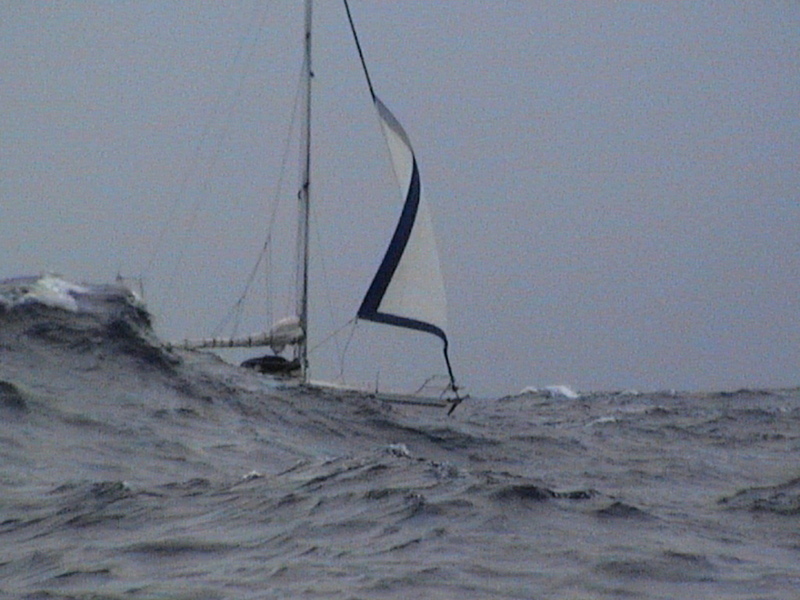 In 2003 there were four sailing trips. The first, in the spring, was to the East Aegean islands, from Leros to Samos (Lipsi, Marathi, Fourni, Arki, Archangelos) and back to Leros. The second, in the early summer, was from Leros to the Cyclades and East Aegean (Archangelos, Patmos, Marathi, Donousa, Rhinia, Syros, Kithnos, Tzia, Paros, Nikouria, Amorgos, Levitha, Lipsi, Fourni, Samos) and back to Leros. The third, in the late summer, was from Leros to the Dodecanese (Kos, Telos, Yiali, Kalymnos, Marathi, Agathonisi) and Samos. The fourth trip, in the autumn was from Samos to the Dodecanese (Arki, Marathi, Lipsi, Kalymnos) and ended in Leros. In 2004 there were five sailing trips. The first three, in the spring and early summer, were near Leros and Samos. The forth, in August, originated in Samos and ended in Kos, it covered Chios and the Turkish coast from Çesme to Bodrum. The fifth, in late September and October, originated in Samos and ended near Gibraltar in Sotogrande, Spain. It was the first leg of my most ambitious trip yet: a crossing of the Atlantic Ocean. In January of 2005 Thetis completed her voyage from Samos to Martinique in the Caribbean thus crossing the Atlantic Ocean and fulfilling my childhood dream. In 2006 Thetis stayed in the Aegean. She went north from Samos to Limnos and to the Cyclades in the west. In 2007 Thetis stayed in the Aegean. She went north from Samos to Turkey and Chios. She also went west to the Cyclades and the SE Peloponnese. The 2008 sailing season was unfortunately atypically abbreviated. Thetis stayed in the East Aegean near Samos. In May of 2009 Thetis sailed from Leros to Samos, Lavrio (near Athens) and back to Samos. She stayed in Samos until August when she had a nice cruise in the Dodecanese. Finally, she sailed back to Leros where she was hauled out in October. 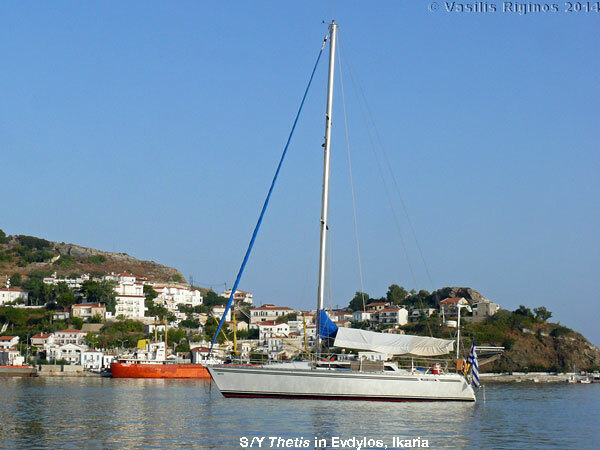 In May of 2010 Thetis sailed from Leros to Samos, Samos to Kythnos and back to Samos. She stayed in Samos until late July when she had a cruise in the Dodecanese islands. Finally, she sailed north to Alaçati in Turkey and then to Chios, Ikaria and back to Leros where she was hauled-out in late October. From December 2010 to January 2011 we had a trip to Kenya wher we saw many wild animals and other interesting sites. While this trip has nothing to do with sailing and cruising, a photograph log of this trip can be seen at Our Trip to Kenya. In April of 2011 together with my daugter’s family we chartered a boat and sailed for a week in the Whitsunday Islands that are in the Great Barrier Reef region of Queensland, Australia. From late May to late October I sailed my boat, Thetis, in the Aegean. There were two separate trips: Samos to Levitha and back to Samos, Samos to Kea (Tzia) and back to Samos via the northern Sporades and the Cyclades. In addition there is the sail of Thetis from Leros to Samos and back to Leros, as well as a number of excursions near Samos. Thetis was launched in April 2012. I sailed her to Samos and then to Alaçati in Turkey visiting cruising friends. From Samos we cruised in the Dodecanese. Among many islands I finally did go to Syrna, one of the few Aegean islands that Thetis had not visited before. Thetis was launched in May 2013. I took several excursions in Samos and nearby islands with family and friends. I also sailed her from Samos to Alaçati in Turkey, visiting cruising friends, and on to Chios and Lesvos. In Lesvos friends joined me for a week of cruising. Thetis was launched in May 2014. I took several excursions in Samos and nearby islands with family and friends. I also sailed her from Samos to Kea (Tzia), visiting cruising relatives and friends. In Leros, in August, friends joined me for a week of cruising. 2015 was an unusual year. Because of family related commitments I was not even sure if we will be able to come to the boat. So, in March I extended Thetis’ lay out contract for another year. But in August I was finally able to come to Greece albeit without my wife Alice. I basically took the boat to Samos and back to Leros, managing two excursions in Samos and some stops along the Samos-Leros route. Thetis was launched in June 2016. I took several excursions in Samos and nearby islands with family and friends. I also sailed her from Samos to Kea visiting my younger brother and several friends. 2017 was a strange year. In addition to the yearly cruises there were 2 weddings (wedding#1 & weding#2) and a funeral. Thetis was launched in May 31 2017. I took several excursions in Samos and nearby islands with family and friends. In September 29, 2017 my dear cruising companion with whom we have been cruising since 1998 lost his 2 year battle with cancer and passed away. He was a cruiser to the very end. There is a Tribute page dedicated to Turgut Ayker.